Right in the heart of Trinity Center; paved street, community water and EZ access to Lake, Alps, and River. Quaint single level cabin with open beam ceiling in ' Great Room'; plenty of living / dining room area, sliders to open decking. Classic wood stove and convenient monitor heating. Plenty of windows, including a spacious greenhouse window at dining. Kitchen opens to dining area with breakfast bar; plenty of counter space and a dishwasher. The main bedroom is extra large, built-ins, plenty of windows and a slider to the front area. Bathroom retains the ' retro' look of the 60's. Second bedroom with built-ins and two windows. 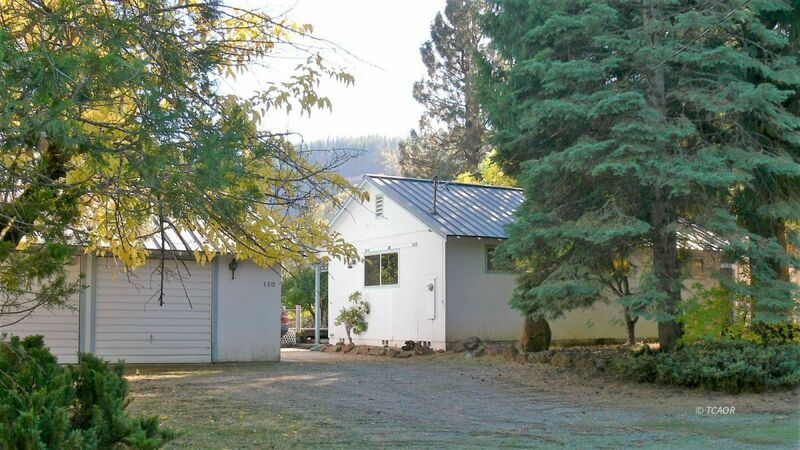 Detached two car garage includes two additional rooms at the rear; workshop, crafts, or storage for recreational gear. The power has been disconnected to the garage at present, with potential reconnect. Ramada at the rear of parcel features straight access from road; for boat or ?? Extra parking along driveway to Ramada and at garage apron. Garden area is fenced. The rear yard is level and offers plenty of room for picnics and taking it EZ. The sale is an Independent Probate, which is an ' AS IS' sale. Ask your agent / broker for a copy of current report.